Join us at Yogini Ashram with the Shiva moon above – to honor the divine masculine and highest consciousness through mantra, Puja offerings to Shiva and a fire meditation. 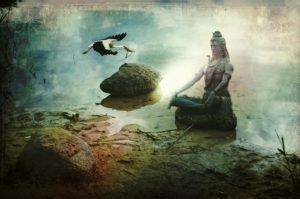 The Pradosham day that occurs just prior to the full moon, a powerful and auspicious day for the worship of Lord Shiva. Such times are a windows of opportunity to remove karma or karmic energies that limit our potential in this current life and clear space for ongoing inspiration, growth and the fulfillment of Dharma.